The automatic CoolCharge is 100% programmable, so there's no standing over and babysitting the automated recharge and recovery process. Oil that is drained during operation is stored internally in a container, and the simple LCD display will indicate how much needs to be returned to the vehicle system. The filter quality and refrigerant levels are also automatically monitored by the machine. Functions will cease in the event the filter is too dirty or the refrigerant level becomes too low to service the vehicle. 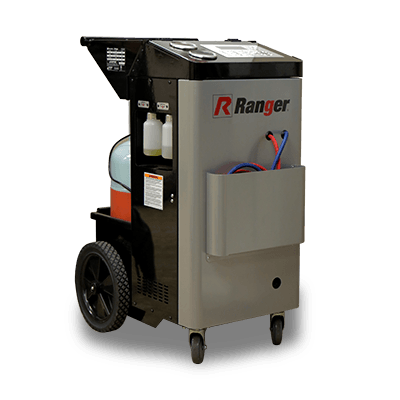 One shop might only need a single A/C machine because the unit is completely portable. Massive 305 mm back wheels and lockable 102 mm front casters allow you to easily maneuver the machine virtually anywhere in seconds flat and conveniently lock it in place with a foot-activated switch.